May Fields—the CEO’s daughter—would like to believe she is above all that. Head of N-Corp’s marketing team, the young woman who has almost everything anyone could want spends her days dreaming up ingenious ways to make workers buy more of what they already have and don’t need. Even before May discovers that the Company is headed for its first loss in thirty years, she is feeling the stirrings of dissatisfaction with the system that has given her everything she’s ever wanted . . . except the freedom to be herself. J. Gabriel Gates grew up in Michigan, the son of a teacher and an industrial supplies salesman. After receiving his B.A. in theater from Florida State University, he moved to Los Angeles, where he acted in short films and a dozen national TV commercials. He wrote several screenplays while working various day jobs: as a host at a sushi restaurant, a car salesman, a construction worker, and the manager of a luxury apartment building. Then, he began writing books. 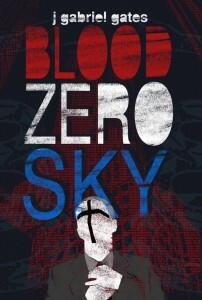 His first two novels, Dark Territory: The Tracks, Book 1 and The Sleepwalkers, were published by HCI Books in 2011; Ghost Crown: The Tracks, Book 2 came out this summer, and the dystopian thriller Blood Zero Sky will be out in October 2012. He is currently at work on a new teen horror novel. To connect with J. Gabriel Gates, visit his website at jgabrielgates.com.